In the middle of this epic film there is a quiet, small scene that helps explain why “Gandhi” is such a remarkable experience. Mahatma Gandhi, at the height of his power and his fame, stands by the side of a lake with his wife of many years. Together, for the benefit of a visitor from the West, they reenact their marriage vows. They do it with solemnity, quiet warmth, and perhaps just a touch of shyness; they are simultaneously demonstrating an aspect of Indian culture and touching on something very personal to them both. At the end of the ceremony, Gandhi says, "We were thirteen at the time." He shrugs. The marriage had been arranged. Gandhi and his wife had not been in love, had not been old enough for love, and yet love had grown between them. But that is not really the point of the scene. The point, I think, comes in the quiet smile with which Gandhi says the words. At that moment we believe that he is fully and truly human, and at that moment, a turning point in the film, Gandhi declares that it is not only a historical record but a breathing, living document. This is the sort of rare epic film that spans the decades, that uses the proverbial cast of thousands, and yet follows a human thread from beginning to end: “Gandhi” is no more overwhelmed by the scope of its production than was Gandhi overwhelmed by all the glory of the British Empire. The movie earns comparison with two classic works by David Lean, “Lawrence of Arabia” and “Doctor Zhivago”, in its ability to paint a strong human story on a very large canvas. The movie is a labor of love by Sir Richard Attenborough, who struggled for years to get financing for his huge but "non-commercial" project. 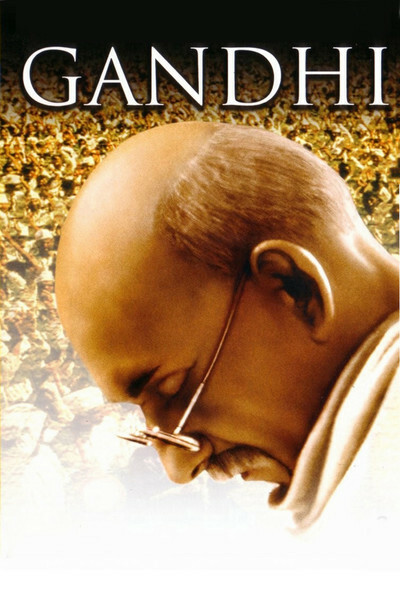 Various actors were considered over the years for the all-important title role, but the actor who was finally chosen, Ben Kingsley, makes the role so completely his own that there is a genuine feeling that the spirit of Gandhi is on the screen. Kingsley's performance is powerful without being loud or histrionic; he is almost always quiet, observant, and soft-spoken on the screen, and yet his performance comes across with such might that we realize, afterward, that the sheer moral force of Gandhi must have been behind the words. Apart from all its other qualities, what makes this movie special is that it was obviously made by people who believed in it. The movie begins in the early years of the century, in South Africa. Gandhi moved there from India in 1893, when he was twenty-three. He already had a law degree, but, degree or not, he was a target of South Africa's system of racial segregation, in which Indians (even though they are Caucasian, and thus should "qualify") are denied full citizenship and manhood. Gandhi's reaction to the system is, at first, almost naive; an early scene on a train doesn't quite work only because we can't believe the adult Gandhi would still be so ill-informed about the racial code of South Africa. But Gandhi's response sets the tone of the film. He is nonviolent but firm. He is sure where the right lies in every situation, and he will uphold it in total disregard for the possible consequences to himself. Before long Gandhi is in India, a nation of hundreds of millions, ruled by a relative handful of British. They rule almost by divine right, shouldering the "white man's burden" even though they have not quite been requested to do so by the Indians. Gandhi realizes that Indians have been made into second-class citizens in their own country, and he begins a program of civil disobedience that is at first ignored by the British, then scorned, and finally, reluctantly, dealt with, sometimes by subterfuge, sometimes by brutality. Scenes in this central passage of the movie make it clear that nonviolent protests could contain a great deal of violence. There is a shattering scene in which wave after wave of Gandhi's followers march forward to be beaten to the ground by British clubs. Through it all, Gandhi maintains a certain detachment; he is convinced he is right, convinced that violence is not an answer, convinced that sheer moral example can free his nation as it did. "You have been guests in our home long enough," he tells the British, "Now we would like for you to leave." The movie is populated with many familiar faces, surrounding the newcomer Kingsley. Where would the British cinema be without its dependable, sturdy, absolutely authoritative generation of great character actors like Trevor Howard (as a British judge), John Mills (the British viceroy), John Gielgud, and Michael Hordern? There are also such younger actors as Ian Bannen, Edward Fox, Ian Charleson, and, from America, Martin Sheen as a reporter and Candice Bergen as the photographer Margaret Bourke-White. Gandhi stands at the quiet center. And Ben Kingsley's performance finds the right note and stays with it. There are complexities here; “Gandhi” is not simply a moral story with a happy ending, and the tragedy of the bloodshed between the Hindu and Muslim populations of liberated India is addressed, as is the partition of India and Pakistan, which we can almost literally feel breaking Mahatma Gandhi's heart. I imagine that for many Americans, Mahatma Gandhi remains a dimly understood historical figure. I suspect a lot of us know he was a great Indian leader without quite knowing why and such is our ignorance of Eastern history and culture we may not fully realize that his movement did indeed liberate India, in one of the greatest political and economic victories of all time, achieved through nonviolent principles. What is important about this film is not that it serves as a history lesson (although it does) but that, at a time when the threat of nuclear holocaust hangs ominously in the air, it reminds us that we are, after all, human, and thus capable of the most extraordinary and wonderful achievements, simply through the use of our imagination, our will, and our sense of right.